Got a mail today from the Windows Phone Marketplace team that application submission to Windows Mobile 6.x marketplace will be stopped effective July 15, 2011. Existing apps will stay on the marketplace, users (whatever remains) will be able to download your apps and more importantly developer payouts will continue to happen as usual. We are excited about the momentum we have with Windows Phone. Since we launched Windows Phone last fall, technical reviews have been very positive and, most importantly, customer satisfaction has been extremely high. Moreover, our Windows Phone Marketplace continues to grow at a fast pace. It now features more than 15,000 apps and games and there are over 40,000 registered developers. At MIX we announced that in May we will release the beta version of the Windows Phone Developer Tools for the next version of Windows Phone, code-named “Mango,” which we are still on track to do. The Mango release will be made available to users later this year, and it represents the next step in our continued focus on advancing the Windows Phone platform and expanding the opportunity for developers. To innovate faster on the Windows Phone Marketplace, we are scaling back our investments in the Windows Marketplace for Mobile service. We are sharing this plan with you, in advance, so that you can make thoughtful plans and preparations. App Submission and Management. 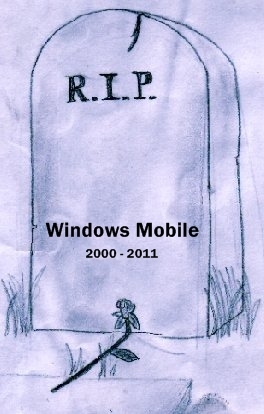 On July 15, 2011, we will no longer be accepting new Windows Mobile 6.x applications or application updates. In addition, it will no longer be possible to modify prices, metadata, or other information. However, you will still be able to remove your apps by contacting support. Developer Payouts. Developer payouts will continue to be processed in accordance with the provisions of the Windows Phone Marketplace Application Provider Agreement. Additional information regarding the scaling back of our investment in the Windows Marketplace for Mobile will be shared over the coming months as plans become finalized. We would like to thank you for being part of our Windows Marketplace for Mobile developer community, and we look forward to helping you build more Windows Phone applications. For more information, please visit the App Hub Forum. For further assistance, please contact support directly. Rest in peace, windows mobile.